One of the biggest complaints about the Subaru Crosstrek and most of Subaru’s cars is how lacking in power they are when driving. You would think the 2019 Subaru Crosstrek Plug-In Hybrid would remedy this by combining gas and electric power, but no—somehow it has even less power than the standard Crosstrek. Like many brands looking to improve the efficiencies of their cars, Subaru has made sure the new Crosstrek platform could have a plug-in hybrid layout, replacing the old hybrid Crosstrek from 2013. The 2019 Crosstrek Hybrid comes with a 2.0-liter four-cylinder Boxer engine combined with an 8.8 kWh battery pack and two electric motors, all managed by a CVT transmission. One motor connected to the gas engine acts as a power generator to charge the battery, also acting as the starter motor, and the second motor drives the powertrain and handles the regenerative brake charging. Combined, the hybrid has an estimated total range of 480 miles if fully gassed and fully charged, with a pure EV estimated range of 17 miles. You would think those two power sources combined could easily smoke the 152 horsepower standard, gas-only Crosstrek, but no. Subaru claims the Hybrid only has an estimated 148 hp output, but it goes from zero to 60 mph a full second quicker than the standard car, which Car And Driver previously tested to be around 9.2 seconds. The fact that Subaru failed to boost the Crosstrek’s power seemed to surprise even them, as the press release initially claimed the hybrid model was the most powerful version of the nameplate to date, and then had to be corrected. Lacking four horsepower isn’t a big deal, especially if the car accelerates quicker thanks to the battery stuff, which takes about five hours to charge on a 120-volt charger or two hours on a 240-volt charger. 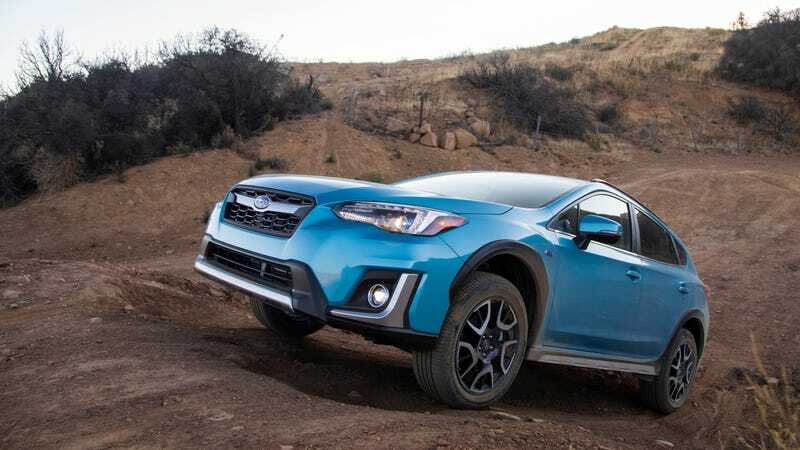 Starting at nearly $36,000 including the destination charge, the Crosstrek hybrid comes standard with all-wheel drive, a towing capacity of 1,000 pounds, hill-descent control, 8.7 inches of ground clearance, active torque vectoring for better handling, and an exclusive Lagoon Blue Pearl color option and unique 18-inch wheel design. It also gets an 8.0-inch screen infotainment system with Apple CarPlay and Android Auto, keyless entry, standard all-weather package with heated front seats, Subaru’s EyeSight driver assistance tech, adaptive cruise control, lane keep assist and lane departure warning, reverse automatic braking, high beam assist, and a pedestrian alert system. While it may not be the most powerful Crosstrek to hit the dirt, it is the most efficient and, well, the most expensive. If you’re the type of person that does not mind plugging in your car when you get home from work, and ideally live in a city, and really want a Crosstrek, maybe this is for you.